Decided to start with the whites, so made a bee line to see Jeff and Nikki at the Liquid Farm table. The 2012’s represent the fourth strong vintage from the LF crew. The White Hill is a great value for their entry level Chard and shows great minerality and the most Chablis-like profile with some salinity coming through. The Golden Slope packs a bit more richness and sees a small percentage of new oak. Along with Paul Lato, the LF Chards are my favorites from SB County. Highly recommended. Next stop was to see Morgan Clendenen at Cold Heaven. Still the reigning queen of Viognier, these wines cement the reputation of “Best Viognier” in SB County. The 2011 Sanford & Benedict and 2012 Le Bon Climat were both gorgeous, but the ’12 LBC was our clear favorite. Both had great stone fruit with the S&B leaning toward pear, and the LBC more toward apricot. Each had great florals that my nose would be happy to sniff all day. 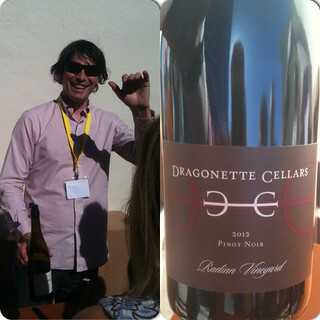 Great to see Brandon Sparks-Gillis again at Dragonette Cellars. Not to be a broken record with the “Best of” comments, but Dragonette easily has the best Sauvignon Blanc of SB County in my opinion. The 2012 Happy Canyon was firing on all cylinders on a sunny San Diego afternoon. Great tropical flavors along with peach and citrus. Mmmmm! We also transitioned to reds with this stop and certainly have to flag the 2012 Radian Pinot Noir as our Red Wine of the Day. Amazing juice – great structure, minerality and balance. Although the majority of the wines at the event were Pinot and Chards, we were excited to taste the 2011 Zotovich Estate Syrah. Dark fruits, plum, tar and a bit of pepper. Very nice. 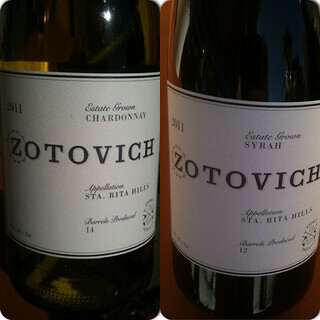 The 2011 Zotovich Estate Chardonnay is excellent as well, with a pear/apple/citrus profile. At this point our hour was quickly passing by and we had to make a few more quick stops. 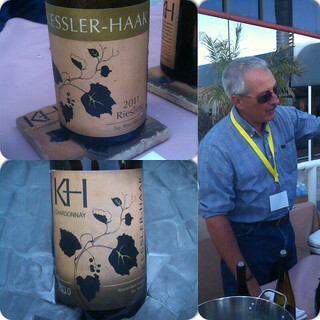 We really enjoyed Dan Kessler’s wines including the 2011 Kessler-Haak Riesling and 2010 Kessler-Haak Chardonnay. Only had time for one Pinot, so chose the Pommard Clone, which I believe was the 2010. Dan’s wines are getting better and better each vintage and are great values. 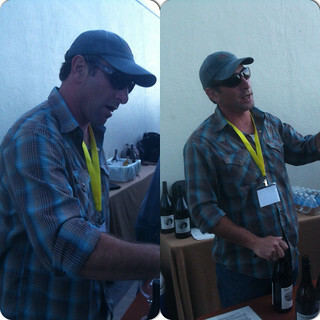 Jake Lindley is a relatively new face among Sta Rita Hills wineries and is coming up on only his second release. 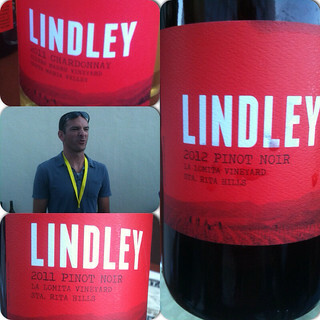 He was pouring the 2011 Lindley Santa Maria Chardonnay, along with the 2011 and 2012 Lindley La Lomita Pinot Noirs. All three were stellar and Jake is definitely a winemaker to watch. At this point I was edging toward the exit so we could make it to our dinner event on time (and in reasonably good shape for the dinner wines). Clos Pepe had the booth closest to the entry, so had a quick chance to chat with Andrew Turner. I didn’t taste the wines, as I had tasted them a few weeks prior at the annual Falltacular charity event in Orange County a month earlier. While I was chatting with Andrew, my wife and her friend grabbed me and brought me to the Flying Goat table next to Clos Pepe. They were loving the 2013 Flying Goat Pinot Gris. 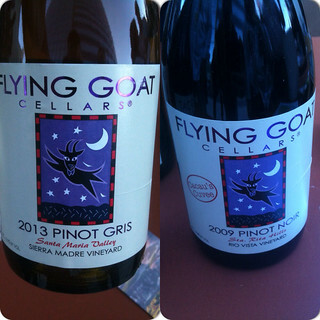 I have been at several events where Flying Goat was pouring, but had never sampled their wines. Perhaps an unconscious aversion to critter labels. Since I was only going to allow myself “one more taste”, I decided to try the 2009 Rio Vista Vineyard Pinot Noir, Cacau’s Cuvee. 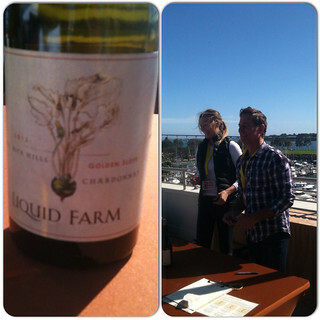 A very solid and well made Pinot that convinced me that I will not bypass the Flying Goat table at the next event! Great write up! What was the cost to attend and how long was it?!?!?! Hoping to get our local Rhone Ranger chapter 'on the road' and wondering if it'd be a good site. We're not as 'prestigious' as the SRHWA, and we only have about a dozen members, but it might work . . .